Students discuss a geologic problem. Early identification of students with an interest in geoscience careers and transfer options is critical to helping them develop a pathway to achieving their goals. 2YC faculty can maximize support of transfer students by incorporating both fundamental geoscience skills and informal advising in their courses. While a strong foundation of basic college-level skills, including writing, quantitative problem solving and laboratory work is necessary for transfer student success, personal interactions and encouragement from faculty can be the essential first step to helping students navigate the transfer process. Find ways to engage with students early in the the term to learn about their strengths and interests. If particular students are already interested in transferring on to study geoscience at a four-year institution, knowing early will help you help them reach those goals. But this also helps faculty to see possibilities for students that they may not be aware of themselves. Students with strong quantitative and problem solving skills may never have considered being a geoscientists but just might if given encouragement. David Voorhees, of Waubonsee Community College, describes the "getting-to-know-you" surveys he conducts at the beginning of the semester to determine which students would benefit from a one-on-one meeting with an instructor or academic/transfer advisor. Students who are engaged - with learning material, peers, and faculty - learn more and have better outcomes. Teaching strategies such as use of learning communities, service learning, and exposure to diverse cultures and viewpoints can have dramatic and substantial positive impacts on students (Kuh et al., 2007; Kuh, 2009). There are a number of different kinds of engaged pedagogies that can be incorporated into classes to foster more engaged interaction. A key benefit of 2YC programs is the smaller class sizes, and thus, more personal interaction with instructors. 2YC faculty are passionate educators who love what they teach. 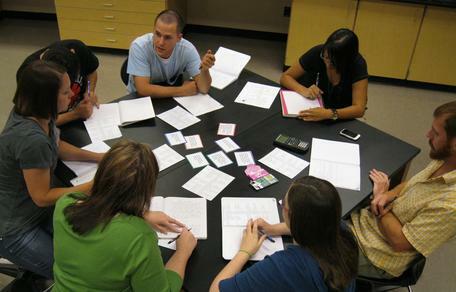 By emphasizing the relevance of course content to future success, sharing their enthusiasm for the subject, discussing their own career path, and highlighting the benefits of additional education during class time, 2YC faculty can encourage students to pursue a higher degree (Packard et al., 2013). 2YC students must be encouraged to see themselves as geoscientists. Incorporating photos of working geoscientists, and emphasizing diversity in the geoscience workforce in lecture slides can foster this. It's also important to explicitly talk about career opportunities and pathways with your students. Many of them will have had no exposure to role models in the geosciences and may not have any idea what a career might look like. The Southern University and A&M College FaST contingent readies their experiment sample inside the GSECARS 13-BM-C enclosure at the Advanced Photon Source at Argonne National Laboratory. Students and faculty conduct seismic refraction analysis to define depth to bedrock in their college town. Provenance: Photo courtesy of Randolph College. 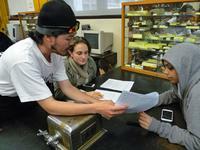 Peer mentoring between students at San Francisco City College. SOARS Mentor Julie Caron, protégé Manuel Hernandez and mentor Joseph Tribbia (left to right). Professional organizations have programs available to invite speakers to campus to discuss career paths and employment options for those holding geoscience degrees, or it may be possible to initiate a similar program at your institution. AGI Careers Roadshow: AGI representatives speak on types of jobs, current workforce trends, and tips on how to best prepare for jobs in geosciences. IRIS Minority Recruitment Speaker Series: Alumni of the IRIS REU and intern programs visit Historically Black Colleges or Universities or Hispanic-Serving Institutions to speak on geophysics career options. Using funds from an institutional grant, geology faculty at Thomas Nelson Community College organized the Jobs in Geosciences Speaker Series. The program brought industry geologists (e.g., mudlogger for natural gas drilling company, environmental consultant) to campus to discuss the day-to-day experiences at their jobs. As members of professional organizations, 2YC faculty and students can gain awareness of beneficial resources, including research opportunities, internships, grants, workshops, and conferences. These organizations can also provide access to a network of 4YC faculty and industry professionals for future collaboration. Many organizations have special membership rates for students and 2YC faculty. Consider using paid membership dues as awards for departmental activities. Packard, B. W-L., Tuladhar, C., Lee, J.-S. (2013). Advising in the classroom: how community college STEM faculty support transfer-bound students. Journal of College Science Teaching, 42(4), 54-60.